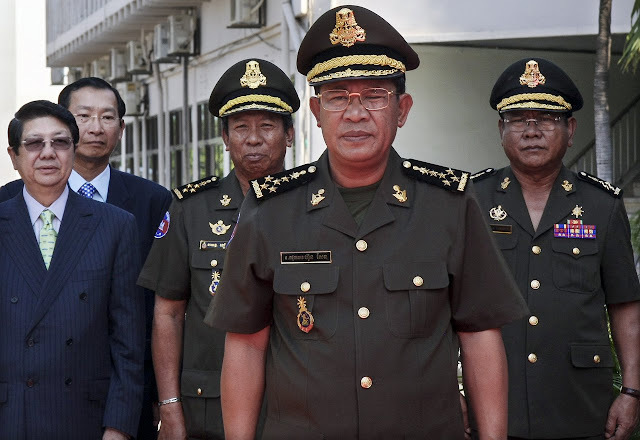 Yes you damn idiot know quite well,that ah dog Hun Sen communist killer is the betrayer and have never honest to no one,even his parent and his wife. Why your party still wanted to join that damn communist killer? Cambodian people all over in and out already tell your party ahead and present why are you complaining for? Funcipic the second wave is about to begin! Hun Sen steal, rob and kill, like father like son. Hun Sen genetic imprint. He loves to be evil and so he is associating with evil VC is the only way. Because they of the same kind. But, in then justice will prevail like always. E.g the righteous will live for ever and the wicked will be doomed and or 'lying is the road to death'. VC and CPP Hun Sen are evils and they love to inflict as much pain as possible because they know their time is short. So, blessed are those who do good. True Khmers are very beautiful. So does our language. Try your best not to set an unpleasant example for 'Khmer'. Swearing, cursing, screaming, yelling, or blaming, does not mean we are caring. And it does not mean we love Khmers or our Motherland. True and Compassionate actions speak louder than unpleasant or untruthful words. unlike the LVEA fruits just only have their look but they are unpleasant taste and bugs living inside . Some of politicians they deserved it sometimes because they lied and do the politic for their own gain and not for Cambodia as their announce. If we see ,hear and know it but still give them approval that mean we are conspiring and doing wrong thing for Cambodia right? I am agree for you to shut me off for my bad mouthed but not for any one make a conspiracy and siding with the malicious one to destroy Cambodia. We learnt a lot lessons from bad leaders already , so let us opinion our thought before it too late. No one are identical even twin. We Khmer can call of to day Khmer political manipulation as an insanity politic. Did you are a pinhead or what ,to believe fox is good enough to walk away from open hen case ? it's a real absurdity thinking . the soft approach leader of CNRP is good for all peaceful Khmer but not with the communist gangster blood thirsty. Brutality , repressive behavior and fascist method of quashing people are the single fact they use to conserve their absolute power . To believe dictator beast to change their habit to be a decent peaceful partner ,is a big mistake , they pretend a good partner for to day and turn to be a vicious rage Animal tomorrow .